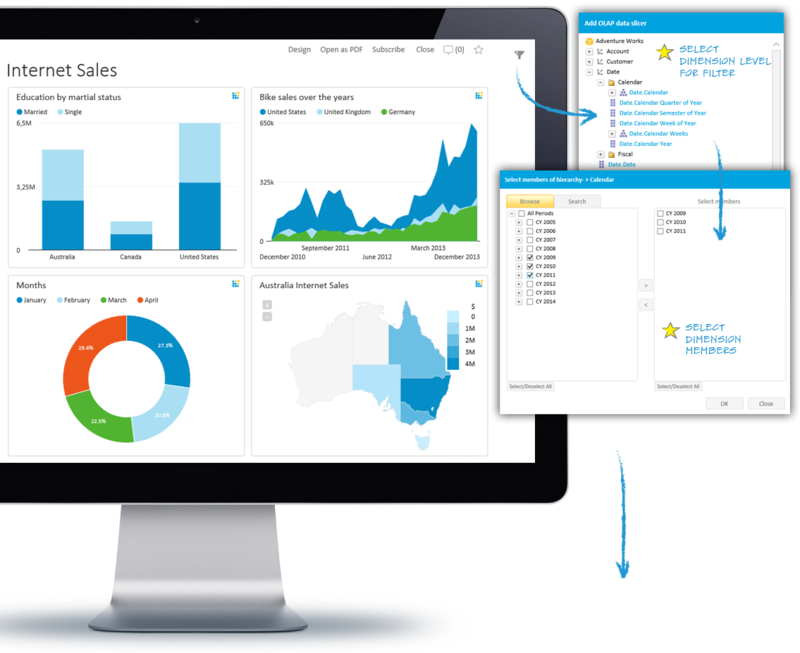 Dashboard includes feature to add dashboard filters and slice OLAP and SQL analyses and queries that are base for dashboard tiles. Learn how easy is to implement OLAP dashboard filters, some tips how to create SQL data filters, how to pass dashboard filters using URL and other useful dashboard filters related options in this article. All tiles on dashboard that are based on OLAP data could be filtered by adding OLAP dimension level members from the same data source (OLAP cube) as the data is used on the tile. When adding filter all OLAP data sources registered on Kyubit BI application are available to choose from. 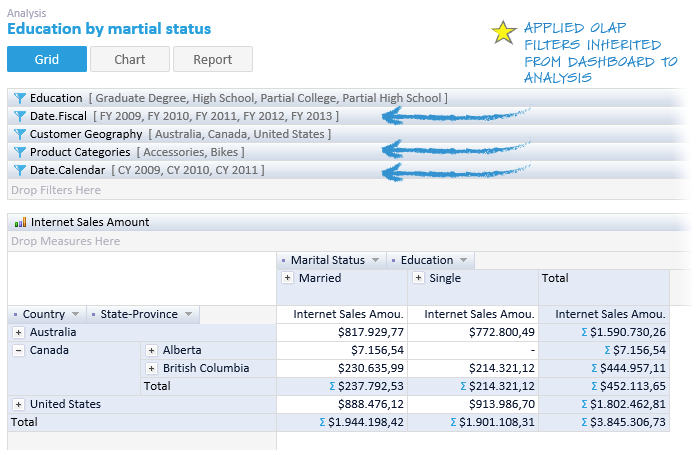 Simply pick required dimension members and add to dashboard filters. 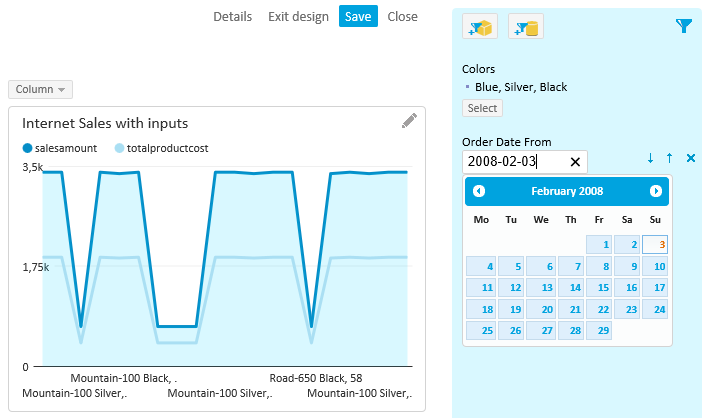 Instantly, all tiles related to same data source as dashboard filters will be refreshed and show filtered data. 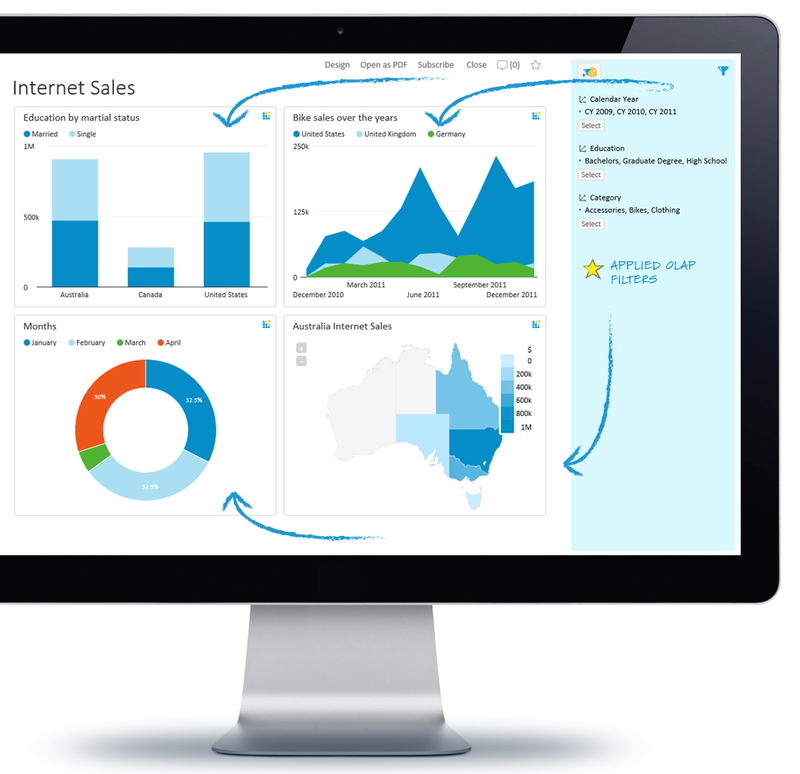 After dashboard filters are applied, all visualizations on the dashboard are transformed, including KPI and Scorecards. By default, all tiles accept dashboard filters, unless tile is configured to be excluded from filtering. When option to 'continue analysis' with full analysis view is selected, it will open OLAP analysis that same tile is related to, but it will also pass (inherit) dashboard filters tied to same tile visualization from dashboard. 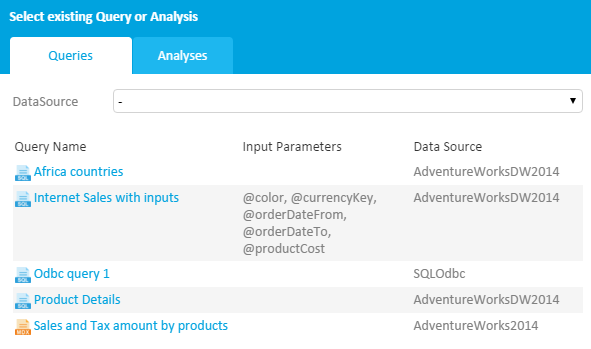 On this way, user can continue to analyze in-depth OLAP data from the point where he left dashboard view. In case when 'Child' dashboard is opened from 'Parent' dashboard (Tile can be configured to open child dashboard), dashboard filters from 'Parent' dashboard will be also applied to 'Child' dashboard and will be displayed in gray color. Kyubit Dashboard page could be opened by external application or link. In that moment there is an option to pass dashboard filters we would like to have on dashboard after opening. 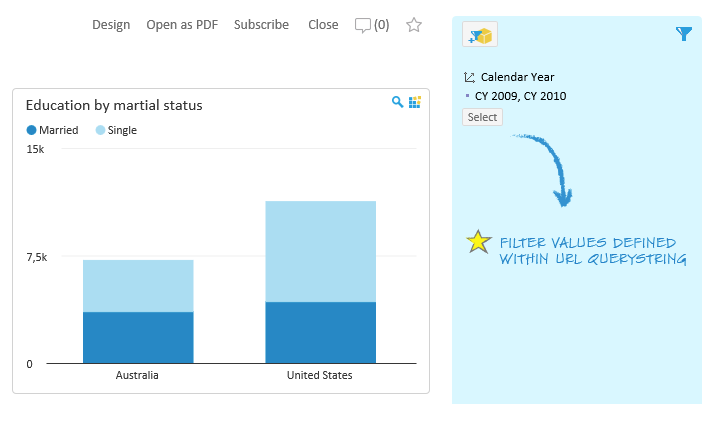 Dashboard filters via URL could be used for OLAP and SQL filters as well. Each filter added to dashboard has its own "Input parameter" name. When adding OLAP filters, "Input parameter" is unique name of dimension hierarchy of the OLAP filter, while in case of SQL filters "Input parameter" is named manually (see next section for SQL filters). In any case, while working in dashboard design view "Input parameter" name is visible when we move mouse over dashboard filter name. Dashboard filter for OLAP dimension "Date.Calendar" is added to dashboard with unique dimension level name "[Date]. [Calendar]" as filter input parameter. Multiple values and captions are separated by semicolon (;). URL could contain multiple filter "Input Parameters", each with multiple values defined. So, dimension hierarchy unique name automatically became "Input parameter" for the filter, while "Input Parameter" + "Display" is holding captions for selected values. Same principles works for SQL Filters when added to dashboard filters. In case with SQL filters, "Input Parameter" will be manually set. At any time, check dashboard design mode and move mouse over filters to see its 'Input Parameters' they are ready to accept. 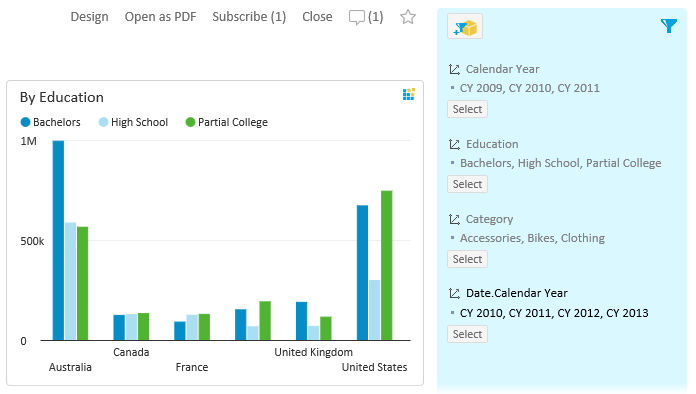 Dashboard filters added using URL later, can be used to continue analysis within OLAP analysis view, export dashboard to PDF file or open child dashboard. On the other side dashboard filters added using URL are temporary and are not saved for later usage. Data on dashboard could also be filtered by adding SQL data filters. For this concept to work, SQL Queries with ‘Input parameters’ have to be created that requires some basic SQL knowledge. Once you get dashboard chart that is based on SQL query with ‘Input parameters’ you can add SQL filters that would filter data on the dashboard. SQL Filters could be static ‘Numeric’ and ‘Date Time’ input fields, or they could be drop down list of values that comes from SQL queries defined as ‘Query Type’ = ‘Filter values’. For more details on SQL filters and creating SQL queries with input parameters, please refer to Dashboards user manual , sections 8.2 and 8.2.1.